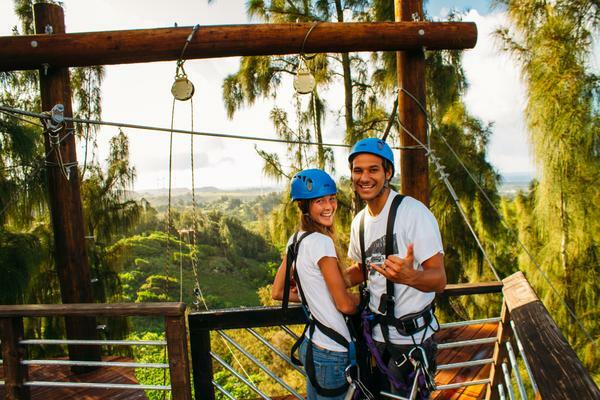 K eana Farms, Oahu’s first zipline tour, consists of 7 world-class dual ziplines, unique sky bridges and boardwalks, a fun ATV adventure to the top, and a couple of surprises – making this the ultimate Hawaiian experience. Starting high in the mountains, you’ll have a bird’s eye view of a working commercial farm that produces over 1 million pounds of produce each year. By safely zipping over the farm, you’ll be able to explore a commercial operation without the dangers of direct interaction. Tour lasts approximately 3 hours. You must be at least 7 years old to participate. If you are under 80 lbs and at least 7 years old, you can still participate but you may be required to ride tandem with a guide or another lightweight sibling. Please inform us of any lighter participants in your party upon making the reservation so we can make arrangements. You must weigh under 270 lbs in order to participate. Anyone that weighs 250 lbs or more, we recommend being in good physical condition. We strongly discourage from participating anyone that has: recurring injuries, recent surgeries, or difficulty lifting your legs to your waist. Everyone must wear closed-toed shoes. No Chacos or Five Finger shoes. Everyone must sign a participant form. Those under the age of 18 must have a parent and/or legal guardian sign for them. 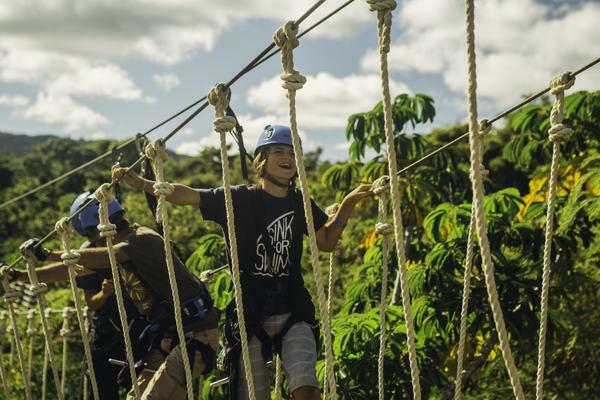 Anyone participating under 18 years old must have someone 18 or older ziplining with them. We recommend you be in moderately good health, able to stand on your feet for 3 hours, and comfortable walking half a mile on even terrain. You will NOT be required to “hand brake” or drag yourself over spans on cable. Our carefully designed course, innovative brake, and expert staff will take care of you from start to finish. You just have to worry about having a great time. Dress appropriately for weather.Comfortable clothes are recommended. Rain in Hawaii can come and go very quickly so we recommend wearing clothes that you don’t mind getting a little wet. Short shorts, loose jewelry, and baggy clothes are not recommended. You may bring a camera ONLY if it is secured with a strap. CLIMB Works also takes photos of you ziplining available for purchase. Bring something to pull back long hair. Glasses and sunglasses can be worn as long as they are secure and/or will stay on your face. We do not allow backpacks or fanny packs unless for medication. Water stations will be available to you throughout the tour. Leave valuable items at home. We can hold onto your phone and car keys behind the front desk. Everything else must be left in the car. We do not allow unsecured items(phones, keys, water bottles, etc) that can fall out while ziplining. This is for the safety of those working or traveling under our zip lines and platforms. Those that suffer from medical conditions that require immediate attention. Those with existing or recurring injuries or who have recently had major knee, back, or leg surgeries. Those under the influence of drugs, alcohol, or anything else that impairs judgement. 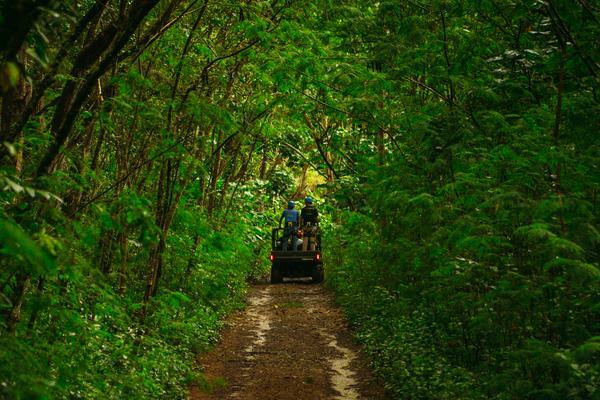 Those with serious mental or physical handicaps or disorders that would not enable them to complete the mental and physical tasks that happen throughout the tour. From start to finish, you’ll have constant panoramic views of one of the most beautiful places on earth. Tucked high in the lush mountains overlooking North Shore’s famous beaches, the only concern you’ll have is which backdrop is better for your pictures. 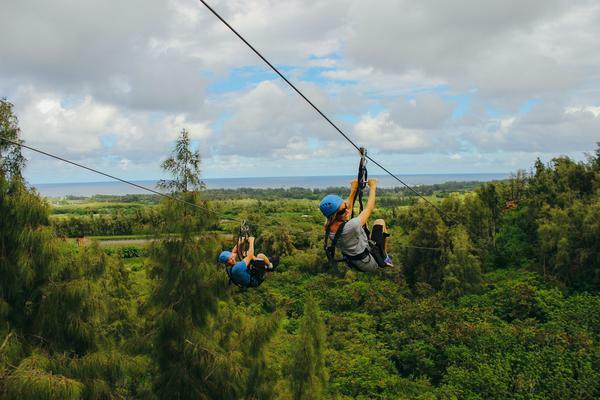 Our long, high, and extra-quiet zip lines are designed so you can see the Fabled North Shore’s famous beaches, farms, and lush mountains with the person of your choice right next to you. 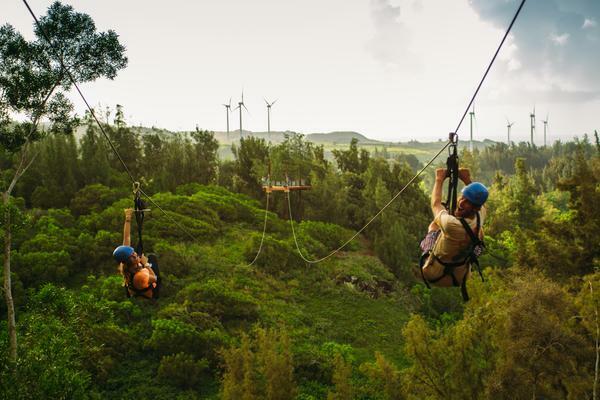 What is a zipline tour? 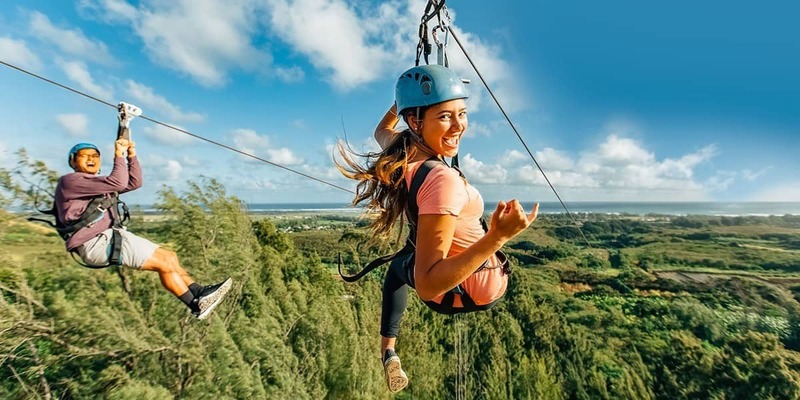 A zipline tour is a series of cables stretched between trees or poles in which participants are attached to the cable with a pulley that attaches to a climbing harness. Each line has a take off ramp and a landing ramp. Multiple lines make up a “course”. Lines usually increase in length and speed as you progress down the course. What should I expect on a zipline tour? 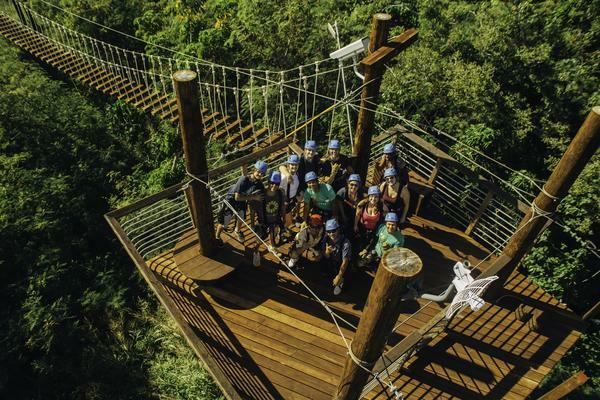 Zipline tours usually involve some light hiking and stair climbing. All gear is provided but you must wear close toed shoes and weigh between 80 and 250 pounds. 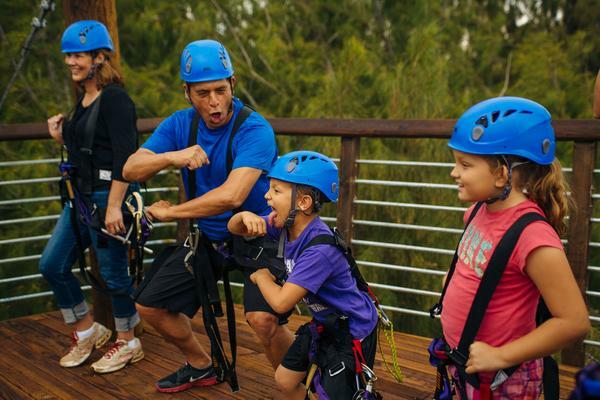 Some zipline courses can accommodate lighter weight kids or a bit heavier people but not much more than 270 lbs. Should I zipline if I’m afraid of heights? If you are afraid of heights then this is the perfect tour for you! Why? Because it will be much more thrilling for you (as opposed to someone who is not afraid of heights) and it’s a great way to overcome your fear in a safe environment.